For years Disney fans have been purchasing Disney stock and received a colorful themed certificate in return. The certificates are collectible and feature several Disney characters and an image of Walt Disney. 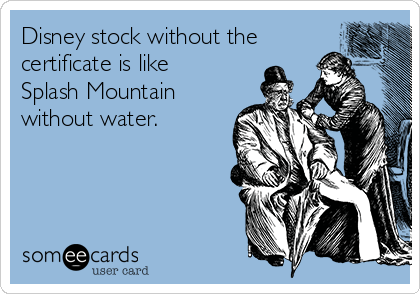 Two days ago, Disney announced that as of October 16, 2013, stock certificates will no longer be issued. Disney will issue stocks through an electronic format and the change will impact collectors who enjoyed framing their certificates. Non-negotiable certificates will be issued after the deadline to those wishing to have a paper form. Will this change prevent you from purchasing Disney stock in the future? This entry was posted in Walt Disney World and tagged Disney Stock, Walt Disney Collectables, Walt Disney World. Bookmark the permalink.